Eating and drinking my way around the world! 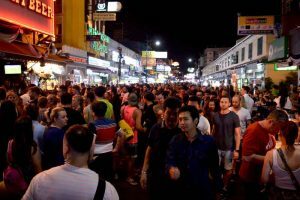 Khao San Road, the must go, in spot, party on, wild fun, famous Bangkok street known to every backpacker out there. 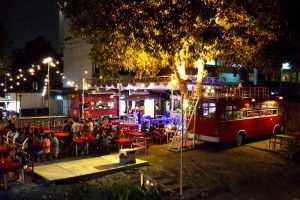 Last stop or first stop, it will give you a going away party you will never forget, or set the mood for your upcoming backpack adventures, either way, you will not soon forget Khao San Road! 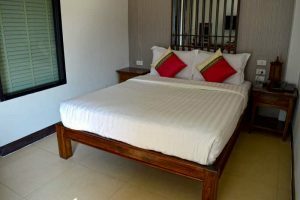 Following our super-geil stay in Koh Tao, and a long day of ferry boat and bus travel (read how to get from Koh Tao to Bangkok), we finally checked in to Cha Cha 2 Hotel on Rambuttri Road. By 10:45 PM, freshly showered and dressed we grabbed a late dinner at Gun Thai Food. For 360 baht / USD$10.50, we consumed 2 large Chang beers, 1 lemon shake, 1 fried chicken noodle, 1 basil chicken stir fry and an order of spring rolls. 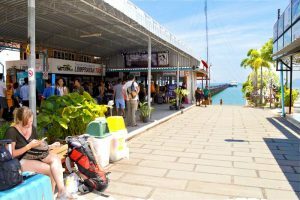 The food was very good, staff friendly and we were pleased with the prices after Koh Tao. Rambuttri Road is a charming place by night; big patio lanterns and one eating establishment after the next with extremely varied prices. After dinner, we strolled one street over to the famous backpacker district Khao San Road. Wild, nuts, fun, busy, crazy! Music pumped into the street as people bounced and danced their way up and down the walking road. We bought a Bucket of Red Bull Vodka for 100 baht / USD$2.90 and joined the party. 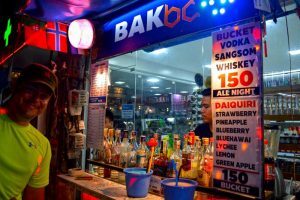 Khaosan is bar hopping on steroids; the road is lined with drinking establishments, all portraying their own styles. Some have live bands, others DJs and some simply blare music from huge speakers and hawk drinks. Venues range between buy and go carts and street stalls with plastic stools to full blown bars with seating, tables and mood lighting. Prices are as varied as the venues and sometimes make no sense at all. Hawkers with sales boards wander the way, trying to lure you into their venue with promises of cheap drinks and ping pong shows.? People dance in the pedestrian only thoroughfare and for the night forget about all their worries. The pleasantly surprising thing about the road was the absence of visible prostitutes / hookers. Somehow, it makes everything more relaxed. I even spotted a few families wandering through – well rounded education?. Although bone-tired from the day of travel, it was easy to forget with the great vibe around us. Alas, exhaustion caught up and we gradually made our way back to our hotel at 1:30 am; Khao San Road, on the other hand, was nowhere ready to sleep! ?Note: Taxis were backed up in a traffic jam which barely moved – if you need to get out by taxi or uber, go a few streets over. Rambuttri Road looks much different by day; the walking street by night is open to cars again, most of the evening restaurants and shops are closed and there is no music. Definitely more charming by night! However, we did observe a huge, very loud verbal fight while eating between a taxi driver and a restaurant employee which ended in the police taking the taxi driver away. We had lunch at Samuel House, one of the only places open; 2 pad thai and 1 coke 195 baht / USD$5.70. Share your Khao San experience or questions in the comments section below! 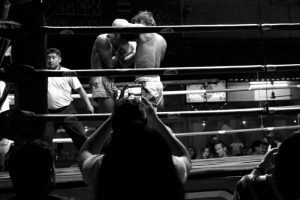 ?Excerpt, The Beach: The Khao San Road is a decompression chamber between east and west. It's where you learn to breathe car fumes and tropical air for the very first time, or else carefully rearrange your memories before you catch your flight home. How to get from Koh Tao to Bangkok with the Lompraya High Speed Catamaran. Hotel Pickup: (Skip this if you did not buy a ticket ahead of time). We were scheduled for pickup at our hotel at 8:15 am and the taxi truck arrived on time, however, we had to wait for one sleeping backpacker until 8:30, and then we were on our way. The pickup was included in our ticket price. Following one more pickup at another hotel, we arrived at the Mae Haad Port by 8:45 am. Ticket: At this point in time, you have to trade your voucher for a ticket and a sticker, or buy your ticket. Make sure you are in the proper line for the proper destination. Unlike other destinations, there was no line up for Chumpon, so we could pass through quickly! With tickets and sticker on our shirts, by 9am we were seated in one of the town restaurants ordering breakfast. Boat Boarding: At 9:45 AM we went back down to the port and were shuffled to the proper line, which they knew according to our sticker. 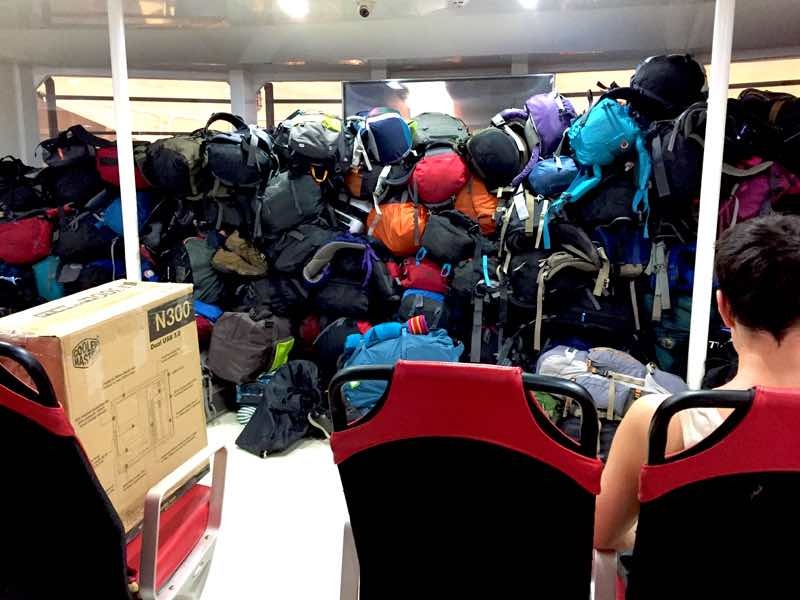 Loading was fast and efficient; suitcases outside, backpacks inside at the front. I kept a sweater with me as the last Lompraya boat ride (read how to Surat Thani to Koh Tao) was freezing – this time the air conditioning did not work.?. Within 30 minutes everyone was sweating and the body odour smells were everywhere. ? Chumpon: We left promptly at 10 am and arrived in Chumpon at 11:52 am. Chaos ensued with everyone jumping up and scrambling for backpacks. Everyone was informed by loudspeaker to exit the back of the catamaran and everybody lined up there. Then they changed their mind 5 minutes later and opened the front doors! People start pushing past and through others – such a shameful bunch of rude young adults ?. Check In: After the walk down the long pier, people were instructed where to go based on final destination. We were corralled into another huge lineup in order to check in for the Bangkok bus. Eventually we got to the front, checked in, got another sticker and were told to be back by 1 Pm for the #2 bus. We had 45 minutes to kill. We decided to have lunch, but fyi there is a beach and lounge chairs and a few people took swims or just lounged around. Our meal of basil fried chicken with rice, and fried chicken noodles, each 80 baht (USD$2.30) were the worst Thai food we have ever consumed?. 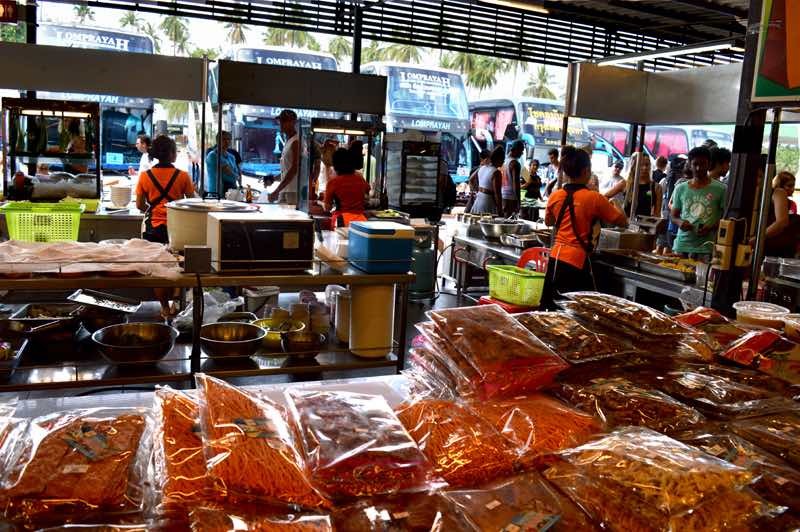 Bus Boarding: At precisely 1 pm, 4 buses to Bangkok pulled up to the terminal. As informed, we entered bus # 2 and got shown to our assigned seats; we did not know we had assigned seats, but we got sent up the stairs to seats with zero leg room – right at the front of the double decker bus. Although we tried to change seats, it was not allowed, so we settled in for the 7.5 hours ride. Rest Stop: At 3:45 pm, the bus stopped at a huge road side rest area for 1/2 an hour. In addition to washrooms, the huge building offered everything from candy, food, chips, snacks and drinks to souvenirs. Arrival: The bus arrived behind schedule at 9:45 pm for a total travel time of 11 hours and 45 minutes. Not sure if it is always the case, but we were left off at the side of a street, not an actual station. 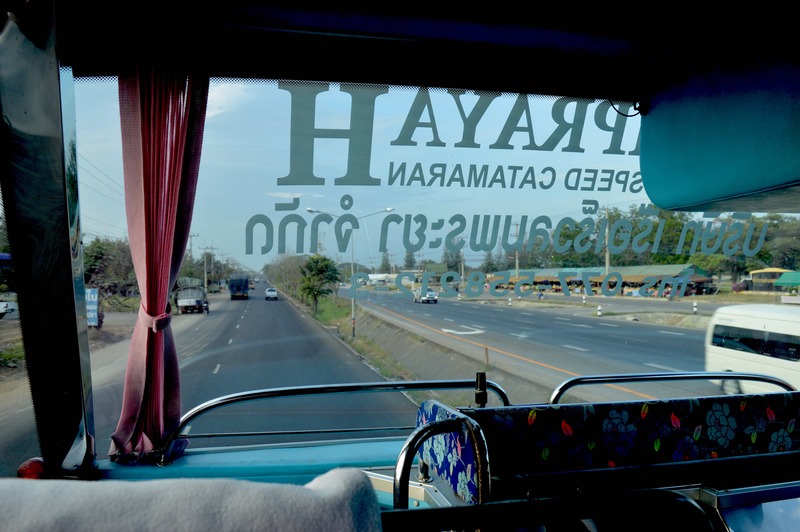 Where does the Lompraya Chumpon Bangkok Bus end? 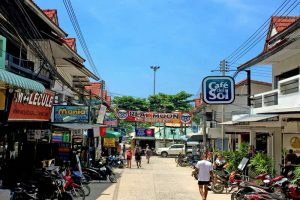 We were one block from the famous Khao San Road and just around the corner from Rambuttri Road, which is where we stayed. If I have missed or forgotten anything, please feel free to add it in the comments below. Incredible views of turquoise waters, secluded bays, fabulous beach nights. 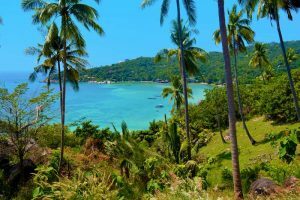 This is the tourist paradise island of Koh Tao, where backpackers and rich merge. 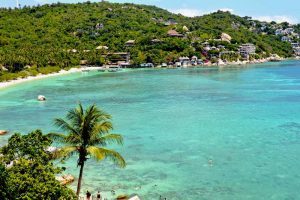 Be prepared to spend money – a lot of it, to truly enjoy all the island Koh Tao (photos here) has to offer, OR risk your well being and push yourself to the limits to capture the paradise on a budget, like us?. 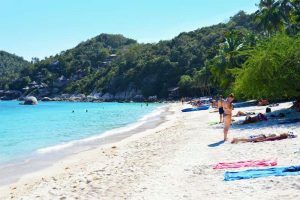 Lavish, expensive resorts dot the mountainsides and claim the beautiful beaches while backpacker hotels and hostels line Sairee Beach, the port town Mae Haad and dusty, barely there side roads. That being said, some of the best budget hotels have supreme views! 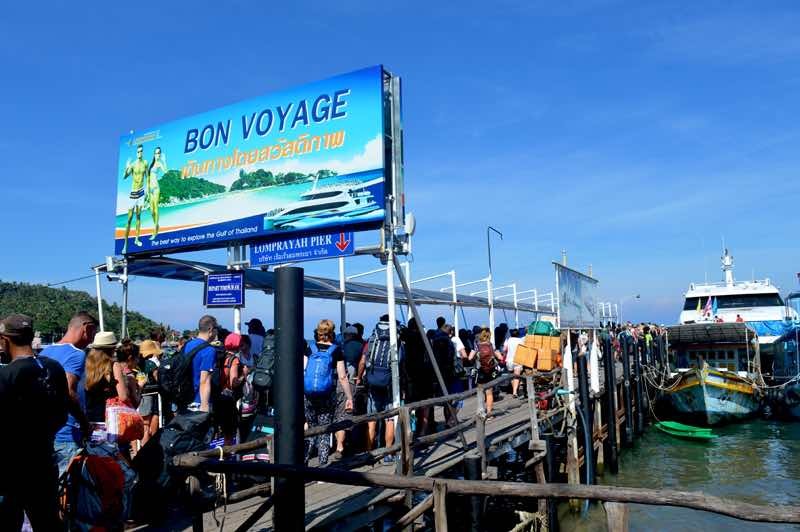 Budget travellers are seen walking the beaches and streets in flip flops or barefoot as well as whizzing around on mopeds without helmets. Many can be seen on crutches and or with bandaged body parts; Real Moon Parties and mopeds the main culprits. It is not the quiet little island it is rumoured to be, rather it is over run with tourists. I suppose what makes it “quiet” is the lack of activities; other than scuba diving, snorkeling, hiking and drinking, there is not a lot of things to do ?. Ya, I do not understand either. That being said, a part of me likes it here very much; unrivalled beauty and snorkeling with the sharks help me like it?. 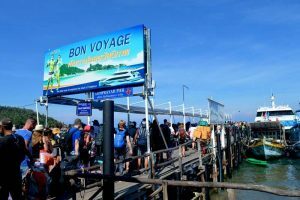 Our time on the island started with our arrival from Bangkok via Surat Thani with the Lomprayah Speed Boat Ferry (learn how to here). As it was late, rather than going straight to our room, we decided to eat first. The small port town Mae Haad has many eateries; we chose the Pool Restaurant, a short walk from the pier. 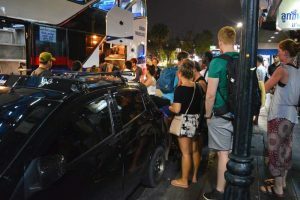 Following a satisfying, albeit expensive dinner at 540 baht (USD$15.60) of Cashew Chicken, Green Curry with rice, 2 beer and a coke, we went in search of a transportation to our hotel. The Taxi trucks are expensive and unwilling to bargain; roads, other than the main road are rough, bumpy and often time, barely there. 300 baht (USD$8.70) later and we were dropped at our bungalow in the Secret Garden Village. Our very cute, comfortable Secret Garden cabin was pre-booked through Orbitz for USD$40 including tax for 3 days; each night thereafter, we paid 1100 baht (USD$32). It was outfitted with air conditioning, fan, kettle, instant coffee, tea, tv, big bed, fridge, asian bathroom and a deck with chairs and table. First on the agenda the following day was renting a motorbike (Secret Garden rents mopeds, but they were all gone, so we did a short walk to the next rental place); 200 baht (USD$5.80) per day for the first 3 days, plus 900 baht (USD$26) for the 5 extra days (fyi:saw long term 1 month for between 70 & 90 baht/day). We made sure we had helmets, although most people do not wear them and checked the bike carefully before scooting off to the nearby Grocery Market (best prices) for iced coffee and some cold drinks. Heading to the south, we found ourselves stopping for lunch at OK 2 Bungalows, overlooking the incredibly beautiful Thian Og Bay, better known as Shark Bay. This place is amazing! 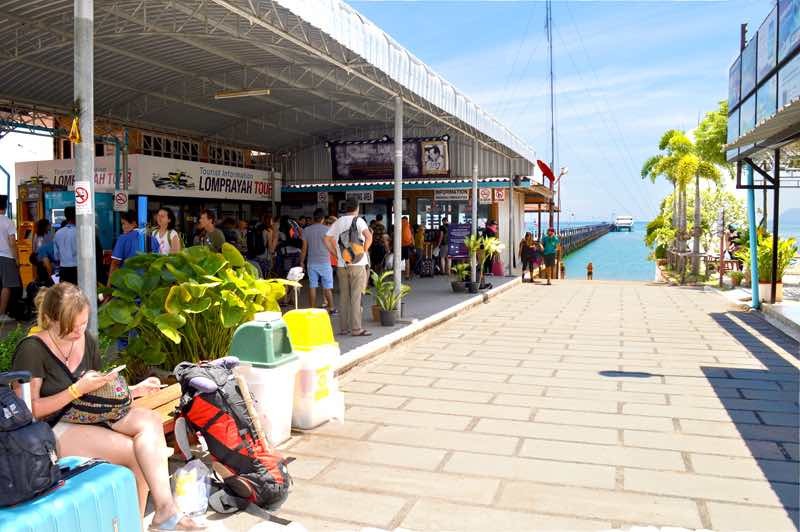 Spectacular view, great prices (for Koh Tao), tasty food. For simple well priced accommodations with possibly the best views on the island, I definitely recommend this place to backpackers / budget travelers – but be prepared to climb a lot of stairs! Our lunch of Cashew Nut Chicken, rice and Chicken fried basil with a coke and beer came to 305 baht (USD$8.80). The rest of the day we spent exploring the island. After much searching and price comparing, we decided on Seasons Food Thai Restaurant for dinner. Once again, this was a great choice and it actually became our Koh Tao go to restaurant! Our orders of Green curry, cashew chicken, basil chicken, 2 beer and 1 coke came to a total of 530 baht (USD$15.30). 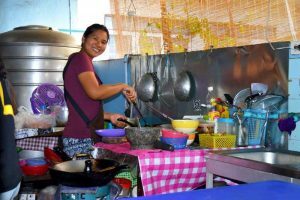 Food is not budget friendly in Koh Tao.? Following dinner, we found a wonderful little stand selling buckets!? We bought a 150 baht (USD$4.35) bucket of blueberry margarita and went for a stroll on the very active Sairee Beach. Note: This IS where you want to spend your evenings. There are quiet, candlelit bars and restaurants as well as loud, crazy party places, like Lotus Bar. Clouds greeted us the next day, but we had a lot of things we wanted to do in Koh Tao and limited time to accomplish it, so we pushed full speed forward. After our morning grocery store coffees, we motorbiked straight to OK2 Bungalows for breakfast rice with a view. By the time we were finished our very late breakfast (noon? ), the sun was shining and all of the snorkeling and dive boats had left, leaving shark bay almost completely to ourselves and a few other laggers. 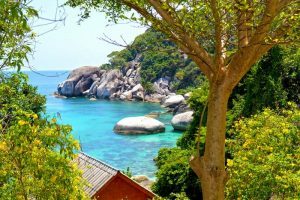 After renting some snorkel gear – mask, snorkel and fins – from OK 2 (250 baht each / USD$7.25), we cautiously walked down the steep stairs, across the slippery rocks and enter the sparkly blue water. As if on cue, the clouds disappeared and the sun came out! ?Tip: wear water shoes or dive booties; we cut our feet all over climbing the rocks. Shark Bay / Thian Og Bay has earned it’s name, there were black tip sharks all over the place. We spent about three hours just watching the majestic predators slowly slicing through the water; some appeared to be mother and baby, some perhaps pregnant. As if the outing had not been perfect enough, a huge turtle escorted us back to shore! The only unfortunate part of amazing Shark Bay is the vast bed of dead coral?. People, you have a responsibility – stop destroying your future. Unfortunately, I do not have any photos of the great marine life, but if you do, please add them in the comment section below! For dinner, we went to the very popular Hippo Burger, the place with a Hippo price. They have a patio with quite a few tables; a good atmosphere with music playing. Their Happy Hour is from 8 pm to 10 pm; the Passion Fruit Mojito is regular 160 baht / USD$4.65, reduced to 100 baht / USD$2.90 – we bought 2! Our very delicious ? 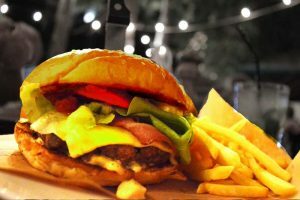 Cheese Bacon Burgers with Fries were 280 baht / USD$8.10 each. 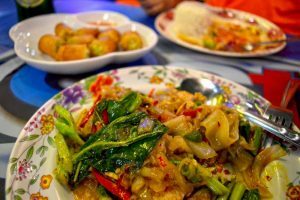 Our most expensive meal on Koh Tao and although delectable, will not be repeated. 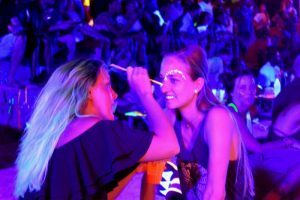 Following our mouth-watering meal, we grabbed 2 buckets from BAKbc and made our way to the Lotus Bar on Sairee beach for drinks, glow paint and fire show! Oh, in other words, the Real Moon Party. 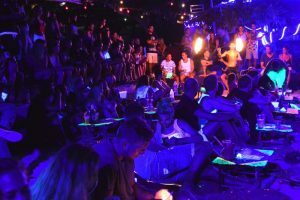 It was a incredibly fun, crazy night, I suppose a very soft version of the famous Full Moon Party on Koh Phangan. Many of the crowd had actually come from the Full Moon party a few days ago, here for the next party! At breakfast the next morning, we ordered a chicken baguette and got a burger ?. This was actually very common throughout our stay on the island and not specific to any one place. Just smile and eat it! After filling our moped with petro 70 baht / USD$2.00 we drove to some lookout points where truly breathtaking views from around the island greeted us! Our last planned destination was Mango Viewpoint / Mango Bay and eventually beach. Needless to say, it is an ⚠️ extremely hazardous ride there – no exaggeration⚠️. This is NOT for the faint of heart; steep hills in both directions with a narrow cement road which turned to slippery dirt at times. A few, like myself chose to walk part of the way. We got as far as Mango Viewpoint, where we were charged 100 baht / USD$2.90 entry fee each, before I had more than enough and begged for mercy. Most did not make it that far, but a few brave souls made it all the way to Mango beach and said it was fabulous. A better, safer idea is to go with a taxi boat. The next days found us hanging out, driving around, walking the beach, and eating. 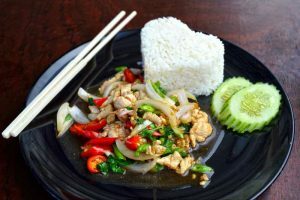 One nice little spot we discovered on the main road was the Naa Krua Thai Restaurant; they plate the food beautiful (hearts etc), the vegetables were fresh and crunchy, the chicken tasty – fabulous experience, great place, check it out! Our Lemon Shake, Chiang beer, Fried Basil Chicken and Pad Thai came to a total of 270 baht / USD$7.80. 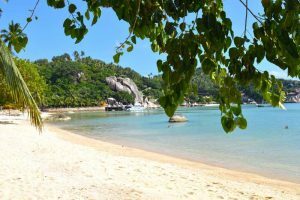 One day, we drove out to the Haad Thien Beach Club where we had to pay 100 baht each / USD$2.90 for entry to Shark Bay Beach. On the plus side, we assume that fee allows you access to the swimming pools and lounge chairs, however, we only used the beach. 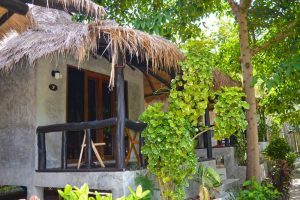 An alternative, is to snorkel in from OK 2 Bungalows; either way, don’t forget to bring your own drinks and food or your platinum credit card?. The beach has a restaurant, a bar and fresh water showers. Another good eatery we found was the Bingo Restaurant. 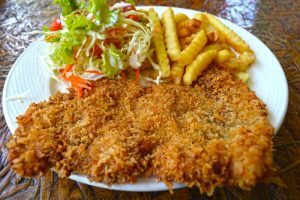 Although they also serve Thai food, we had a fabulous western meal of schnitzel and french fries with lemon shakes! Yummy?. Saan Jao Beach in Taa Toh Bay, is a wonderful place to spend some time. Take a towel and go for a swim or sit in one of the many restaurants and enjoy a drink or meal while taking in the beautiful views. To see more beaches, and photos with tagged info, feel free to visit my photo gallery. 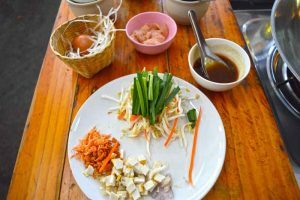 Across Thailand there are slight variations on the Thai food; in Kho Tao it is sometimes completely different than what you ordered, but they will insist it is what you asked for. The most drastic was when I ordered a green curry chicken and ended up with some almost dry chicken and vegetables on a small plate, but the price was the same as the real dish! Keep smiling? 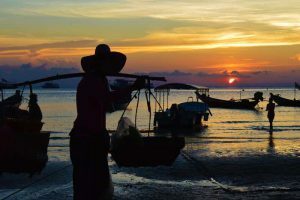 Koh Tao in a nutshell: Incredibly beautiful, expensive food, affordable lodging, lots of sharks, not as quiet as you think. 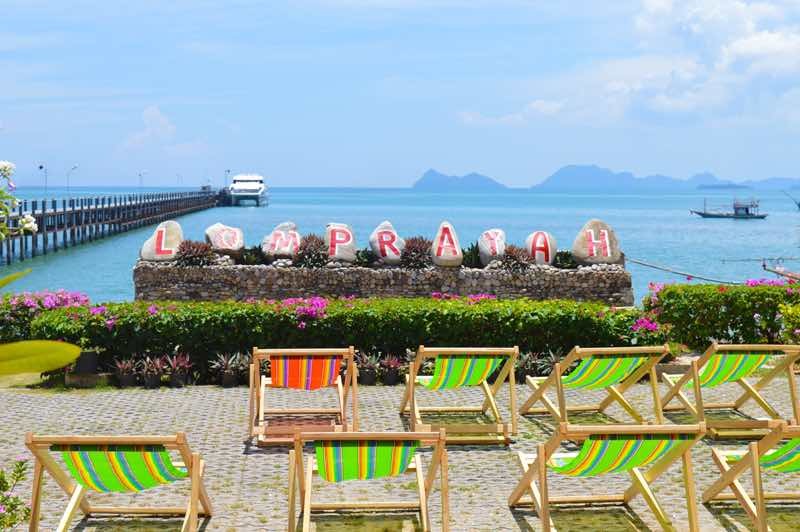 – Very good deals with great views to be found on Sairee Beach Happy hour etc. How to get out of Koh Tao (read how step by step): We took the Lompraya Boat and Bus to Bangkok for 1100 baht per person / USD$31.80 (duration 10 hours), 8:30 am hotel pickup – be sure to book from where you are staying, because you get picked up at your hotel; this way you avoid paying the expensive taxi trucks!!!! Your thoughts, experiences and budget tips are appreciated! Please use the comment field below. 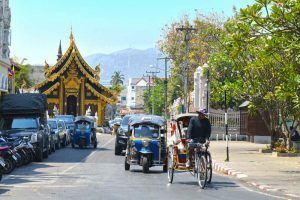 In the magical mountains of Thailand lies the enchanting city of Chiang Mai, home to Temples, Muay Thai Boxing and delicious Thai Cuisine. We arrived mid afternoon in this busy mountain city Chiang Mai, via the Green Bus from Chiang Rai. Our first frustration? 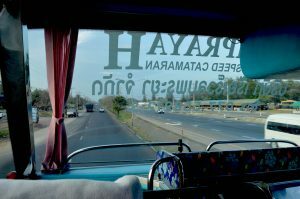 was trying to get transportation to our hotel; Uber was too expensive, Taxis refused us and Tuk Tuks wanted a small fortune; most were unable to read our western written hotel address. ?Tip: Be sure to have all addresses in Thai for drivers. Finally, after walking away from the station, we found someone in the street willing to phone our hotel for the address and take us for, after negotiating, 100 baht / USD$3.00 (he started at 200 baht). 15 minutes later we arrived at C Hotel Boutique and Comfort on the outer wall of the old city. The reception was very friendly and informative. The bright room had a balcony, a comfy big bed with fluffy pillows and bedding , fridge, water kettle with complimentary tea and coffee, flat screen tv with cable, air conditioning and a modern bathroom with big fluffy towels and a hairdryer!!! Until now, the best room of the trip with a great smell thanks to incense sticks. Cost: 1,700 for 2 nights (850 per night / USD$25) View my PHOTO GALLERY for more pictures of Chiang Mai. 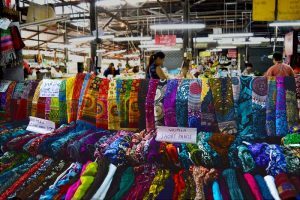 The list of things to do in Chiang Mai is a smorgasbord of activities. Probably, if not already templed out, temples top the list, but also on offer are river cruises, trekking, mountain biking, rafting, kayaking, cooking courses, spa, Elephant camps and more. But first on our list is a quick shower and a search for food!? Feeling refreshed, we grabbed an Uber and took an 8 minute drive, 39 baht (USD$1.15) to the Tikky Cafe. Great deal! The restaurant had a cool vibe?, in spite of it being tourism pure – certainly no Thai people here, other than the help. 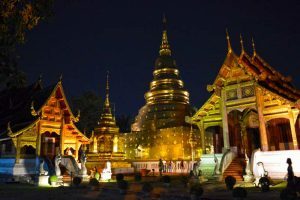 After dinner we walked to Wat Phra Singh, which was beautifully lit for the evening. The sound of monks singing echoed through the courtyards. ?The temples are definitely worth 2 visits, once during the day, and once by night! We also found the Wat Phan Tao temple and Wat Chedi Luang Worawihan with its ruined chedi (stupa) from the 15th century and Wat Pan Whaen. Next we wandered toward the night market; after Chiang Rai, this was disappointing, but still nice for a walk. Eventually, we ended up at the Iron Bridge which crosses the Mae Ping River. This seemed like a cool place to spend some time. ? The next morning we went to a little corner cafe across the road called Lek House for a breakfast of Pork Pad Thai and an Omelette with rice for a total of 105฿ / $3. It was very good! Energized and ready to go, we headed back into the old city to see it by day. After circling hours through the numerous temples, we found ourselves at the indoor Warorot Market (map). It is very big and sells everything from food to clothing; interesting walk through and great prices. 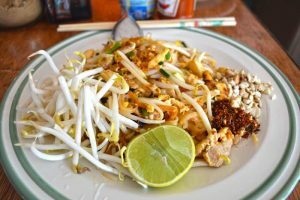 For lunch, we found a restaurant called Pad Thai Rachadumnoen, which became our go to eating spot due to the great food with fantastic prices. At the end of the blog, you will find some of the dishes we ate along with the prices. Each dish was amazing! I definitely recommend everyone to try this restaurant and let me know what you think! ‼️Before 11am and between 2 pm and 5 pm you cannot buy beer? 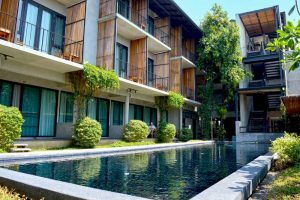 In the morning we checked out of C Hotel, ordered an Uber car (60฿ / $1.75) and checked into Lamphu House Chiang Mai as a small treat for the end of our vacation. Located in the old city, this is a nice hotel with a pool! Cost: 2 nights 2000฿ / $58. 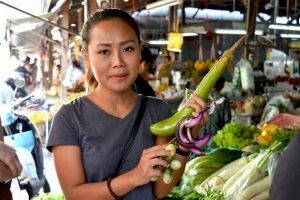 We finished up our Chiang Mai time with two leisurely days of swimming, eating, drinking and strolling around the city! 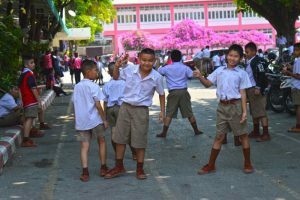 Visit my Chiang Mai Photo Gallery for more pictures and info! - Be helpful to the Uber cars; they have problems with the red taxis, so sit in the front seat so it looks like you are friends. Next Stop: Bangkok – Booked Air Asia from Chiang Mai to Bangkok, Saturday March 11. – 1,300฿ / $38 each. 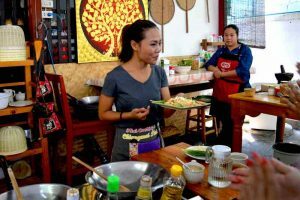 One of the Top things to do in Chiang Mai is a Cooking Class, where you can learn how to shop, prepare and cook traditional Thai Cuisine. 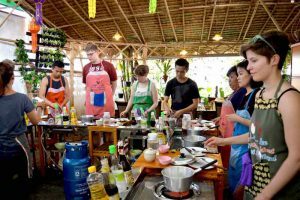 Deciding I could not leave Chiang Mai without doing a cooking class (photo gallery), I emailed Zabb-E-Lee Thai Cooking School to reserve a spot; cost 900 baht / USD$26. Time to check it off the bucket list! The following morning at 8:45 AM a tuk tuk truck with a few other people in picked me up from our hotel lobby and transferred us all to the market parking lot. Here we met Chef Bow, introductions to my 9 fellow class mates were made and some explanations regarding Thai Dishes were presented. We were then asked which dishes we were interesting in preparing, a huge shopping list was created and we then all entered the market to begin our schooling. 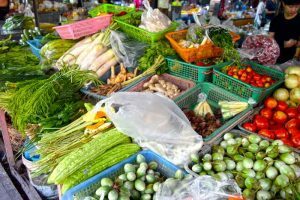 Around 45 minutes were spent at the market, including valuable information regarding the vegetables and spices used in Thai dishes and some free time. While we had our free time, Bow was busy filling the shopping list. We all helped carry the goods to the truck before making the 5 minute drive to the school. The casual feeling facility makes a good first impression. Bow took the time to show us around, pointing out the washroom, lockers where we can store our personal belongings and then the dining area with a large family style table. We all grabbed a seat and were offered coffee, tea and water, while the staff did some pre-cooking preparations with the fresh meat and produce. Facing us were the cooking stations where the magic happens! Everything was impressively clean. 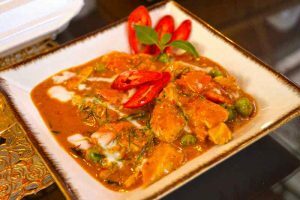 Each person is permitted to choose 4 dishes to prepare including an appetizer, a soup, a stir fry and a curry, in addition to the Sticky Rice with Mango and the Curry Paste which you need to make your curry. 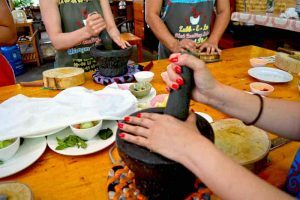 ?If you are observant and not shy, you can watch and learn the preparation of every chosen dish! 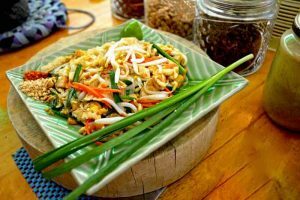 We began with the Stir Fry and the Soup, I chose to learn how to make the Pad Thai (a stir-fried rice noodle dish) and the Tom Kha Kai (Coconut Milk Soup with Chicken). Bow did a fantastic job walking us through the process, guiding us when we needed help and keeping everyone enthused! When our first two dishes were complete and plated, we all gathered at the dining table to photograph, eat and share our fare. The next lesson was how to make curry paste. 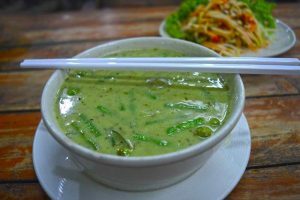 As I had chose the Green Curry Chicken (Kaeng khiaw wann gai), I needed a Green Curry Paste (Num phrik kaeng khiaw wan), other pastes were prepared as well. After a lot of pounding, a smooth paste finally resulted and we now had the base to prepare our curries. But before the curry preparation, we needed to make our appetizers. 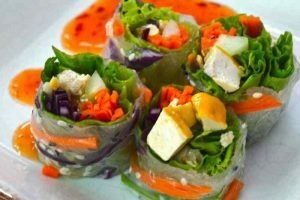 On a previous visit to Thailand, I fell in love with the Papaya Salad (Som Tum), so it was a natural choice for me, although the Thai Fresh Springroll (Kway Teow Lui Suan) was very tempting.
? By now, the group dynamic is marvelous! Everyone is laughing, helping and sharing! Upon the group completion of our chosen appetizers, we all returned to our stations to finish cooking our curries. When everything was properly plated, we returned to our dining table to eat the finished creations. The results were mouth watering amazing! Of course, by now it was almost impossible to eat any more, so after taste testing all the dishes, our dishes were packed up in take away boxes along with a nice serving of Mango Sticky Rice. Everyone was presented with a paper back Cook Book with all of the recipes before saying our goodbyes, and being transported back to our hotels. It was now 4 pm (7 hours total), I was full and had learned a lot, including how to actually use a wok pan; definitely worth the 900 baht. Hopefully I will be able to re-create what I learned! Thank you Bow and Zabb-E-Lee Thai Cooking School! Copyright © 2019 TravelFoodDrink.com. All rights reserved.